For centuries, Polynesian islanders have been drinking kava, the traditional beverage of South Pacific royalty. We wanted to try it, too! Fijians are often referred to as the friendliest people on earth. This could be an understatement. High on our list of traditionally “Fijian experiences” was to partake of kava, so heavily entwined with this country’s national identity. We have been impressed by the strong sense of community and culture here in Fiji, as well as respect and acceptance for the individual. When the opportunity arose to drink kava in the traditional way right here in the neighborhood, we gladly accepted. Kava became known to western civilization after it was shared with Captain Cook during his Pacific voyages in the 18th century. Today, kava is consumed in traditional ceremonies in Fiji, Samoa and Tonga, and throughout the Pacific region in more casual settings. The traditional kava ceremony (the sevu-sevu) is intended to culturally unify visitors with villagers, and create a social bond among groups. Kava drinking rituals respect community status, strengthen relationships in an honorable way, and are sometimes used in attempts to communicate with spirits. Kava can also be consumed in capsule, extract and drop form. Kava is made from the root of a bush that is related to the pepper plant. These roots are ground into a powder, which is then placed into a cloth bag and strained with water. Kava, also referred to as “waka” in Fiji, is widely available in Fijian fresh markets. It can also be obtained from home-based entrepreneurs who grow and grind it for sale. There are several hand-lettered signs in our Korotogo neighborhood offering waka for sale at individual residences along our bus route into Sigatoka. Is there any medicinal benefit to kava? According to WebMD, kava is “possibly effective” for treating anxiety There is insufficient evidence for other claims that kava is medicinal, although it has been used for: withdrawal from anxiety medications, cancer prevention, insomnia, stress, restlessness, ADHD, epilepsy, chronic fatigue syndrome, headaches and common cold. WebMD also reports, rather begrudgingly it seemed to me, that “early research cites some benefit” to sufferers of menopause-related anxiety and hot flashes associated with menopause. Is there a downside to kava consumption? WebMD’s article immediately cites “BIG safety concerns” with using kava: liver damage and even death. Canada, Germany, Switzerland, and other European countries have total bans in place. Kava’s importation into Australia is restricted to medical or scientific purposes. According to WebMD, serious side effects have occurred even with short-term use. If you use Xanax or sedatives such as Ambien or Ativan, drinking kava may cause too much sleepiness or drowsiness. Kava may decrease the liver’s ability to break down certain medications as well, the most common of which are Valium, Elavil, Prevacid, Dilantin, progesterone, ibuprofen, Celebrex, acetaminophen, erythromycin, and statins. As we do not use any of the pharmaceuticals on the extensive list, we weren’t too concerned about harmful side effects. Perhaps we are just inured to the overbearing protective language required in U.S. drug advertisements. Our personal issues with pharmaceutical companies are another post entirely. According to an Australian resource which seems to be addiction-focused and alcohol abuse-centric, other negative symptoms that have been reported by those consuming kava are: appetite loss, tiredness (duh! ), raised body temperature, nausea and vomiting, dark urine, abdominal pains, jaundice. Kava is not mud, although many westerners believe it tastes like it. To us, it tasted “earthy” and more like cold chai tea. Not unpleasant at all, but not necessarily a thirst quencher, either. Kava is not a manufactured pharmaceutical. It is entirely plant based and not laced with other substances for consumption. While kava is likened to alcohol for its soporific and relaxing effects, there is no evidence of physical dependency or risk of withdrawal symptoms. Wikihow explains 3 ways to make the kava drink here: http://www.wikihow.com/Make-Kava The most common way is to use a cloth bag to hold the powder and then strain water through the bag into a larger container from which individual cups are ladled. When entering a village always bring a gift of kava root. It can be picked up at a local market. Women should always wear a sulu (sarong) and dress modestly. Men should dress respectful as well. Everyone must sit down and remain seated during the ceremony. You are allowed to take photographs, but it is always respectful to ask. The chief (the eldest man in your group) presents the root to the Village Chief. The ceremony then begins as the villagers grind up the Kava and strain it through a cloth bag into a large wooden bowl placed in the middle of the room. Then the village’s executive head drinks the Kava before it is offered to the rest of the room. After that it is shared with everyone. The men drink first and then the women. When you are offered a choice between “high tide” and “low tide” this refers to the quantity of kava in your cup. Our hosts graciously allowed me to film our kava experience the other night. Bula! Kava makes your mouth tingle! Thank you for all of this extremely interesting information about kava! Having spent a great deal of time in Hawaii where it is quite popular, I always wondered about it but never dared try it. I’m glad to hear that their is no evidence of risk of physical dependency as with alcohol. Truly great post! This was so cool! I’ve used Kava from time to time, in conjunction with Valerian Root to help with sleeplessness. Heard about it years and years ago when I was in my total herbal remedy phase. While Kava doesn’t cause hallucinations, it did give me extremely vivid, motion picture type dreams. As with all herbal remedies, if you over use them they do have the ability to build up in the system and become toxic. They sometimes take longer to work too. So there’s a balance of small doses over a certain period of time and then giving the body a rest from it. Not something to be messed with if you don’t know what you’re doing. I liked using it because unlike OTC sleep aids it never left me foggy the next day. There was no dependency on it either (other than wanting more of those dreams!). Love the ritual involved, thanks for sharing that. Bula Deb – Interesting that you used kava for insomnia, and that your dream sleep was affected. From what I’ve read, we remember dreams better when we’re actually not that deep in REM sleep, so perhaps there’s a disruption of sorts. You’re right about the buildup. Those who use kava for extended periods of time develop a flaky rash. I was a little foggy the next day because I actually didn’t sleep well when we returned home. Go figure! Hi Betsy and Pete .. you’ve experienced so many things in the last year – the travel, new countries, new cultures, and customs … I imagine this must have been an amazing experience. What a great opportunity to see, taste and join in the Kava custom … interesting about its properties too .. Interesting post- I knew nothing about kava before reading it-the ceremonial facts are really interesting. Bula Billie – yes, the ceremony is definitely part of the mystique. This brings back such great memories! 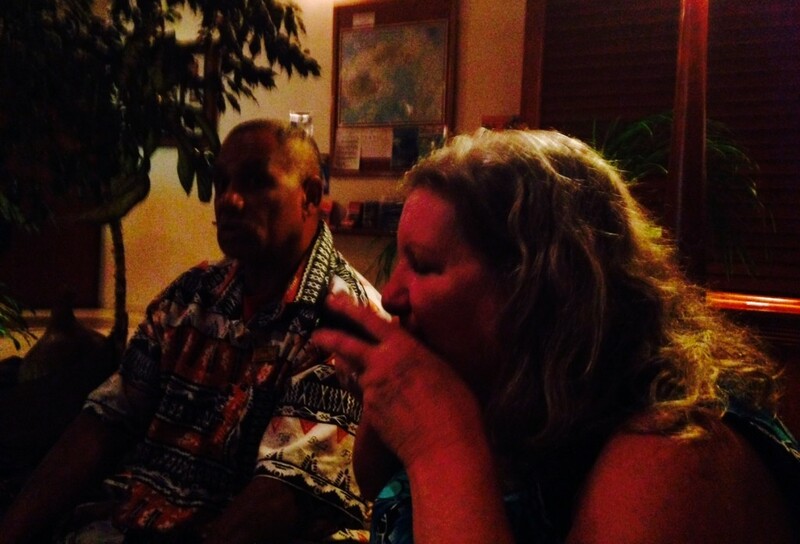 We house-sat in Fiji for 4 months and were so excited to participate in a “real” kava ceremony…to me it tasted a little like peppery dish water 😉 my lips and tongue were numb, but no other bad effects. We even bought our own coconut shell bilos and a straining bag at the market for “at home” kava parties, lol! Thanks for sharing and I hope you’re continuing to enjoy Fiji! Thanks, that was an informative read. I have heard of kava, but until right now, knew almost nothing about it. I can see myself being intrigued to try it once, but beyond that, I think I would shy away. The ceremony that goes with the drinking is a nice ritual, too. I haven’t been in a US pharmacy for awhile but kava-kava used to be sold over the counter in many pharmacies and found with the herbals and supplements. It’s use was promoted as a mild tranquilizer or sleep medication. Love the idea of a culture that has an introduction ceremony to “culturally unify visitors with villagers ” and wonder if that might be the first step towards world peace..? Bula Anita – That’s right, per Deb’s comment above. Yes, a similar thought occurred to me as well. Fijians could teach the rest of us planet-dwellers a thing or two. I found this very interesting. I had not heard of Kava before. The ceremonial ritual information was fascinating. Bula Donna – Yes, the ceremony is very meaningful. I’ve heard of many sailors visiting the islands and participating in the Kava ceremony. Most of them thought the taste was pretty bitter. Kudos to you! It looks like your ceremony was in a restaurant? Do most of them occur there or in a longhouse? Sorry, but that did not make it sound like a “not to be missed experience”, particularly after reading the medical warnings… But as a once off friendly gesture – why not? Bula Juergen – Yes, the warnings can put people off. But the good will behind the ceremony and practice can’t be denied. Interesting post. Didn’t know anything about Kava, but would be willing to give it a try. Thanks. Bula Veronica – Thanks, we’re glad we tried it and suspect you would be, too. Love the post Betsy! The only kava I knew previously was the bubbly one in Spain which I quite enjoy. I really appreciated all the detail and time you took to explain the background and ceremony around kava. Quite an illuminating post. Bula Sue – Thanks, glad you found it interesting. I’d forgotten about Spanish cava. I haven’t heard of Kava before so I found your post fascinating. I was particularly interested to hear of its properties that aid in sleeplessness, and I wonder if I can find it in Australia. Bula Jo – According to my reading, Australia only allows kava now for medical or research purposes, but it was unclear what that actually meant, and whether it just referred to the unprocessed root. Thank you for the education – all new to me. Interesting how strong the language must be with regards to its safety. Bula Leigh – In no way did I mean to disparage the warnings or the government action taken in various countries, but I do tend to view such things with a fair amount of skepticism. Great post about Kava. I learned a few things. I’ve been to Fiji twice and loved the ritual if not the flavor. It’s definitely relaxing but the party is best. Bula Elaine – Yes, I agree. It’s an honor to join in, no matter the setting. This may sound culturally insensitive, but during the process, it basically looked like the guy was washing out a rag in water—not to mention his coughing before he started. Did that cross your mind? 1. Any viral transfer from his cough most likely would have been diluted by the water. We each had our own coconut cup which also had been floating in the separate water bowl. The water was clean and clear before it was mixed with the powdered root. I’m not a scientist, so that’s good enough for me. 2. The kava bag is used only for straining the kava with water, so the fact that it may not be washed between uses doesn’t bother me either. We purchased one for ourselves in the market the other day, and don’t know anything about its provenance. And we didn’t at first nor have we since laundered it. The drink itself reminded me of cafe au lait in color, and tasted to me like chai tea without the sweeteners we would typically add. So some might think of it as muddy, but I didn’t. Long way to answer your question when I could have just said, “no.” 🙂 I’m getting better at taking everything in while not applying my own values and expectations, though, which is a mindset I’ve wanted to embrace. All this being said, there’s quite a bit that Westerners may find jarring in Fiji, as with any third world environment. This is my first experience in one, unless you count certain areas in Mexico. The thing that affects me personally is bare feet on streets and floors in public places that aren’t as clean as we’re used to in the U.S. There is an open tap outside the marketplace where feet get rinsed off, but rarely dried, and there is quite a bit of sweeping debris with the typical Fijian broom (which works very effectively, and I’ve come to like it around the house here). If barefoot, I would be hobbling around feeling every sharp stone, etc. not to mention cringing away from certain surfaces. Interesting, I was going to buy some when we were in Hawaii but now that I read it’s banned in Canada, I’m glad I didn’t, it probably would have been seized at customs. We attended a kava ceremony in Fiji too. George tasted it (but just a sip! ), but Janice passed :-). So we can’t say personally what effects kava has (since George didn’t try enough), but it was fun watching the village chief and others make the ceremonial kava. Hi Janice and George – Oh, Janice, you should have tried it (says the woman who will taste anything once). The ceremony is really the best part.